Home » Events » World Renowned Malian Musician, Lasssana Diabate! Please note that world-renowned Malian musician Lassana Diabate will be returning to Sydney next week for a series of presentations. I have included his itinerary below. It includes some intercultural music-making and performances, lecture-demonstrations, a film screening, and workshops including one for music educators. Please share the news of Lassana’s visit and these upcoming events, widely. Thursday, Feb 23rd (daytime) – Lassana will work with Cape Breton youth in a workshop, “Intercultural Performance Laboratory” at the Centre for Sound Communities Studio. Thursday, Feb 23rd at 4pm – Lassana will provide a music educator’s workshop at the Centre for Sound Communities Studio! Please bring any instruments such as wooden xylophones and mallets (for you and other workshop participants). Sunday, Feb 26th at 2pm – Lassana will perform in a house concert! Join him and local community members at A Paradise Found Bed & Breakfast (62 Milton Street, Sydney NS), and enjoy a chance to meet and chat with this extraordinary musician. $20 at the door; all proceeds go to the musician. Tuesday, Feb 28th at 7pm– Lassana will be presenting The Sunjata Story: Glimpses of a Mande Epic – the first in a series of films as part of the Global Musics – Local Connections FILM FESTIVAL at the Cape Breton Regional Public Library, McConnell Branch! 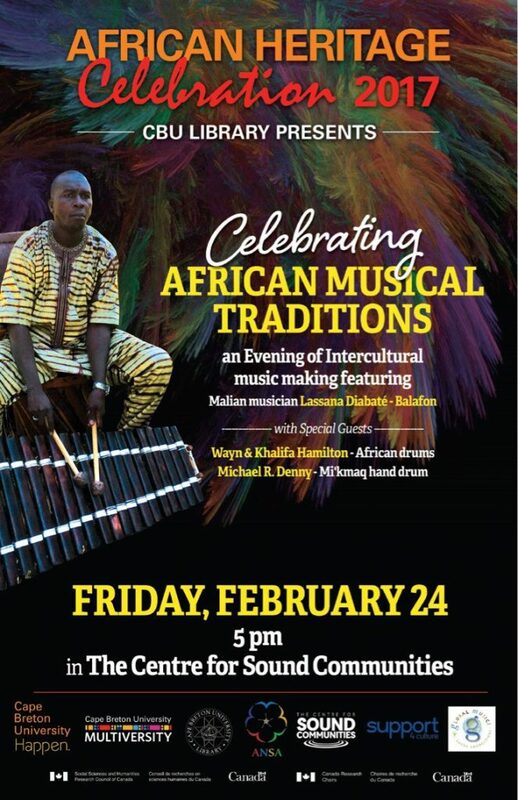 This series of intercultural learning events is a partnership with Global Musics – Local Connections and the Centre for Sound Communities at Cape Breton University. For more information about Lassana and his Cape Breton visit and events, please visit write us at sound_communities@cbu.ca or call Dr. Marcia Ostashewski at (Mobile) (780) 264-7624!